The city of Louisville’s LouVelo bike sharing program is about to expand across Belknap Campus. Crews are expected to install four new stations March 11-12 at the J.B. Speed School of Engineering, between the SAC and Threlkeld Hall, Freedom Park and at the Floyd Street Parking Garage entrance to the SAC. A station will also be installed at The Bellamy affiliated student housing northwest of campus. The stations, which can hold a total of 12 bikes each, are in addition to off-campus LouVelo stations installed at other city locations. LouVelo debuted in the city in 2017 and the short-trip bicycles have become popular as quick, thrifty, fun and environmentally responsible ways to get around. With the new stations, more than 320 bikes at 37 stations will be available to riders across the cities of Louisville and Jeffersonville, Indiana. 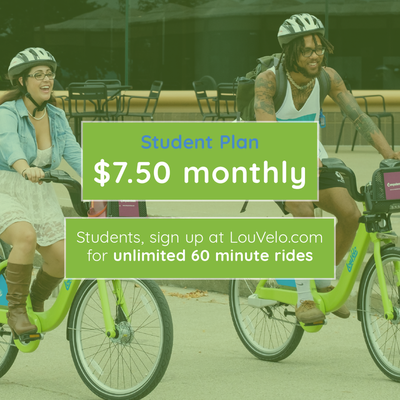 LouVelo’s student pricing plan is $7.50 per month for unlimited, 60-minute rides. Bikes are checked out by membership card or app, and a student plan can be purchased at louvelo.com/additional-price-plans.